It has been exactly two years now. Ma has socially been forced to take her nose pin off and refuses to wear bright floral prints, symbolising the commencement of her journey as a widow. My elder sisters and brother have successfully mastered the art of circumventing this issue while conversing amongst each other. And I have gradually learnt not to stop my eyes from welling up while lamenting my father's fate and have also picked up the habit of being grammatically correct, “My father used to be a business man; he was very fond of munching on biscuits; he was…he did… and he used to”, although I still can't muster the courage to say or write “Late Mr. Muzaffar Ahmed.” And I know, that even today I would reply with a blank stare, if I am asked about the presence of a father in my life by strangers, be it for maintaining records for my National Identity Card or for a mere Job Interview. 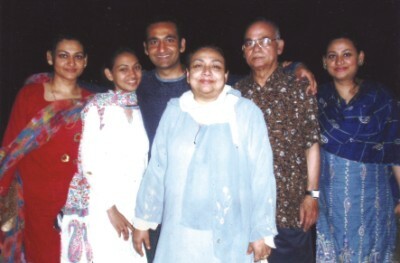 Muzaffar Ahmed (fifth from left) and his family. On September 9, 2007, Muzaffar Ahmed, a father and a husband, was kidnapped while returning to his home from a social club, five minutes away from his residence in Agrabad Residential Area, Chittagong. Although he was kidnapped during the time of apparent utmost success in combating corruption in the history of Bangladesh, the emergency powers rule, the convicts managed to escape in a heartbeat, the very felons who dared to make a withering, dilapidated, old, harmless and a retired business man disappear overnight over a mere piece of land. They escaped because of the ludicrous irony of the loophole of law which destroyed me and my family: because his body was never found. Given such an escape clause, I am convinced that his body will never be retrieved, and nor will any kidnapper ever have any incentive of leaving the body behind. Not to mention, given the geographical nature of Chittagong with plenty of hills and back alleys, such kidnap cases will become all the more common. One of the companions who were present in the club that night with my father had been given enough time to flee by the police, who had been squandering their time and efforts in finding unrealistic reasons behind his disappearance. He remained absconding for over a year till he could use this legal loophole to his advantage, and bailed himself out from the High Court and in this whole time, the efficient bodies of law could not track him. Often, when bluntly questioned by strangers and friends as to why we are not meeting all the Mr. or Ms. Big in their known political and influential circles, I cannot resist saying with utmost difficulty, “I have lost a father…And you would think we have not utilitised our networks properly enough?” It is indeed interesting that one would not be able to name a reachable influential being to whom we have not reached out to. Alas, in spite of all this reaching out, we came up with no answer. So much so, that often people blame us for not trying hard enough. Interestingly enough, some people even go far as accusing us for leading normal lives, celebrating moments of ephemeral happiness in our lives, taking tours and enjoying certain aspects of life. What is more hilarious is that it has been rumoured in certain circles, that we have been hiding our father in a distant country and visit him from time to time. It was so discussed amongst those very circles triggered by the families of the felons, that last month when we took a short, ventilating trip after almost three years to Europe to visit our brother who lives there, we had actually gone to meet our father. One would find all this hard to absorb, but this is what we have to face from time to time. Muzaffar Ahmed was no king of Yaba, he was no political bigwig or a money laundering tycoon nor a valuable archaeological artifact of some globally historical significance. I agree that finding the 70-year-old man does not offer much incentive for the police or the detectives or the Rab. I also agree that flashing rigorous news about his missing status is also not an exciting promotional tool for the media. But he was a father to four children, who I, further agree are also nobodies in the eyes of the concerned authorities, but who miss his gargantuan presence in their lives and who shall continually fight with themselves and question themselves regarding his fate but will know that they will never be able to come up with any answers. And he was a husband to a lovely lady who still wakes up in the middle of the night to the sound of phone ringing, frightened and shaky, but hopeful and excited, believing that, that phone call must be it. A lady, who is forever fighting not with Rab or Police or the DB for successfully 'closing' the case, but with Him, who apparently has all the answers to all the questions. I too will continue to question what really happened to my personal hero that fateful night of September 9, but the tragedy lies in the fact that here on earth, all the people my father left in his wake will never be able to come up with any answers. If not for the nobody who is missing for the last two years, and if not for the nobodies in his life, who he has left behind, one could expect the concerned authority to be eying an interest to track such skilled abductors who had successfully excelled in duping four supposedly strong bodies of law, namely the Police, Detective Branch, the Rapid Action Battalion and Crime Investigation Department. After such mammoth changes in the running of the country, starting from Digital Bangladesh to the denunciation of a civil body, it is only natural for nobody's daughter to have some glimpse of hope that someday, somehow, the issue will capture the eyes of the new government of transparency and accountability. That, a miracle shall happen. She no longer dreams of getting her father in flesh, no longer envisions to run to his arms, does not even believe that she would ever be able to see his body, but just hopes that she will be able to find out the truth that has led to his disappearance; Two years has provided her with sufficient stoicism to be able to listen coldly and stolidly as to how they murdered him. She wants to see the faces of those remorseless, brutal beings taking advantage of law, to be disciplined by law. She believes in the power of the mightier pen, and the efforts of the present democratic government. A strong believer of karma, she shall patiently wait for that miracle to happen.